I swear I will post recipes that don’t involve pumpkin soon, but not just yet. I feel like pumpkin is the star of fall recipes, and then we begin to go gingerbread and peppermint crazy come winter and christmas. With remembrance day officially come and gone now, I feel like the holiday season is just over the horizon. Our calendar is slowly filling up with get togethers and parties, starting with our fourth annual neighbourhood party next week at our house. I’m secretly excited because it means that we get to put up our christmas decorations even earlier this year. Truth be told, we already have our tree. We were walking through The Bay one afternoon and noticed their christmas trees were all on sale. Last year we looked for a faux-tree, but all of the ones we really liked were sold out already. We bought the tree in October, so I can see why they would all be sold out when the holidays actually roll around. I guess the early bird gets the tree. So – we now have a faux tree. The past few years we have gotten a real one, but I like the idea of having a fake one to decorate early. Plus, less mess and watering. Bonus. Christmas baking will begin soon, too. Every year I try and narrow down the baking to a few favourites. But we all know I go overboard. I can’t help but bake, and force those around me to eat it. I like to think of it as the spirit of giving. As in, give me another brownie. 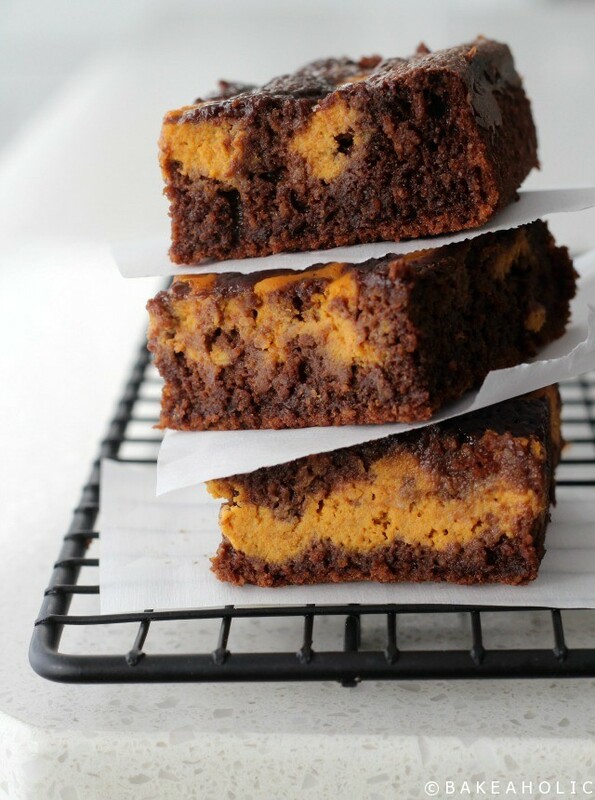 These Pumpkin Goat Cheese Swirl brownies are so. so. good. I was dreaming up new brownie recipes, and the idea of goat cheese and pumpkin stuck in my head. Sort of like the cream-cheese swirl. The goat cheese gives it a good tangy-taste with warm pumpkin spice. A deliciously chocolate fudge brownie with pumpkin goat cheese swirled on top. The goat cheese makes a tangy twist with the chocolate. Line an 8 x 8 inch baking dish with parchment. Powder the oats in a high-speed blender to make a fine powder. Mix powdered oats, baking soda and baking powder in bowl. In a pan, add chocolate and butter and cook on low heat till chocolate and butter melt. Add espresso and brown sugar in the pan and cook till sugar melts. Remove pan from heat and let the mixture cool for a minute. Add eggs, one at a time and beat well after each addition with hand-held blender. Mix the dry ingredients with the wet ingredients and mix well. In separate mixing bowl, beat the goat cheese, pumpkin, egg and spices together. Add as much pumpkin spice as you like. I like mine spicy, and add in more nutmeg as well. There are two ways to add the pumpkin to the top of the brownies. First, you can scoop small dollops to the top and drag a knife through them to mix into the batter. Or, you can use a piping bag to pipe the pumpkin mixture on top in a pattern. Bake for 25-30 minutes, until edges pull away from sides and centre is set. Remove the pan from oven. Allow to cool to room temperature on the counter before lifting out of the baking dish.